Why choose the Gaelic Rose? At 60 ft she is not the largest or most palatial dive boat out there but with a devoted skipper with years of experience and outstanding local knowledge here are some of the things you can expect…..
A boat that’s small enough to let you ashore at jetties other boats can’t get to, but big enough to ride the weather in comfort and safety. And our smaller size means our costs are lower, so we can afford to charge less, saving you money. A style of trip to suit you: hands-on or hands-off. You can take an active role in planning and running your holiday or simply relax and let us guide you. Everyone is welcome in the wheelhouse: you can take a turn at the wheel, or just enjoy the scenery and join in the banter: you’re guaranteed to hear at least one joke you haven’t heard before! Bob’s knowledge of scenic dives on the west coast of Scotland is unrivalled – he’s dived most of it himself in his days as a scallop diver. If you want to explore he can put you on excellent rarely dived sites, including little-known wrecks. Great food: wholesome, plentiful, tasty, and freshly prepared. We serve hot drinks and snacks after every dive; and you can help yourself to drinks from the galley at any time. Vegetarians and people with food allergies are welcome. Aft of the wheel house there is a spacious heated saloon with plenty of windows for viewing. 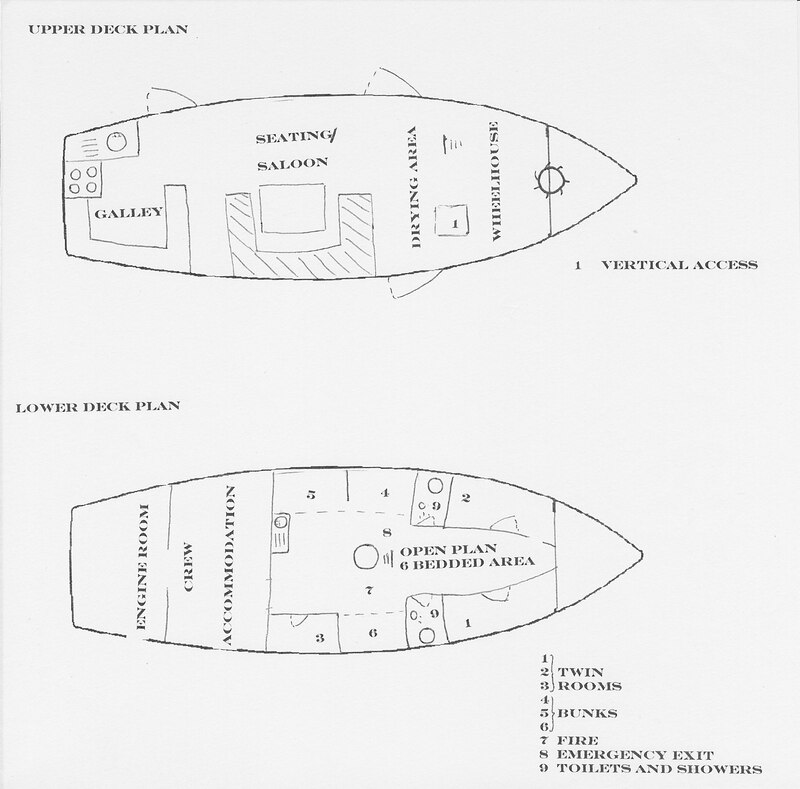 The (small but efficient) galley is adjacent, so that all meals can be served in the saloon. Passengers will find the ample deck space forward of the bridge ideal for viewing the passing scenery. New benches were added for 2011. Full head room accommodation below deck consists of 3 twin berth cabins and 6 open plan bunks around a reflex heater- ideal for drying those damp clothes! There are two toilets with showers.